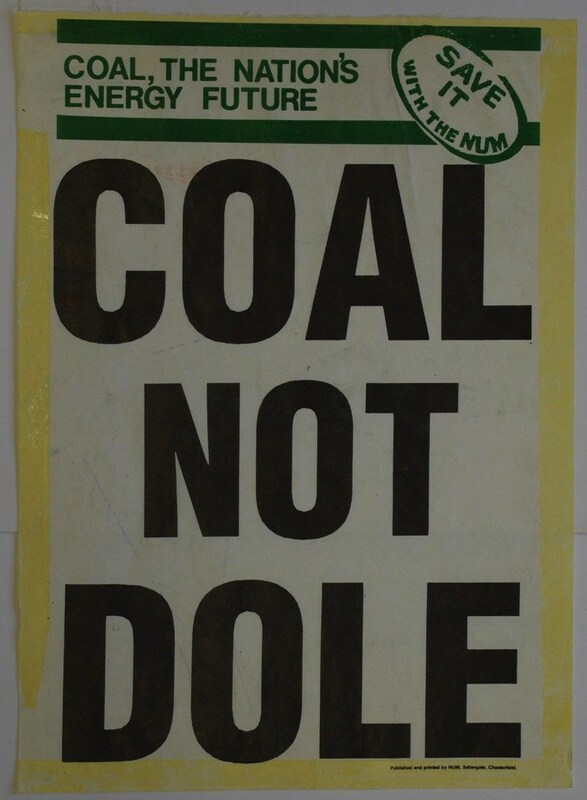 During the 1984-1985 miners strikes ‘Coal not Dole’ was vocalized, printed and worn by striking miners and their supporters. On 1st March 1984 the government announced the closure of Cortonwood pit in South Yorkshire and on 6th March Ian Macgregor, head of the National Coal Board (NBS) revealed further plans to close 20 pits in 1984, with a loss of 20,000 jobs. By 9th March area strikes had been called in places like Durham and Kent. Many felt a national strike was needed but feared areas against strike action, like Nottinghamshire, might swing a no vote in a ballot. So Arthur Scargill decided to call a strike without a ballot and on 12th March around half of the UK’s 187,000 miners came out on strike. No ballot meant the action was illegal, leaving those on strike with no income and ineligible for benefits. So they relied on support groups. One of these was Lesbians and Gays Support the Miners (LGSM). 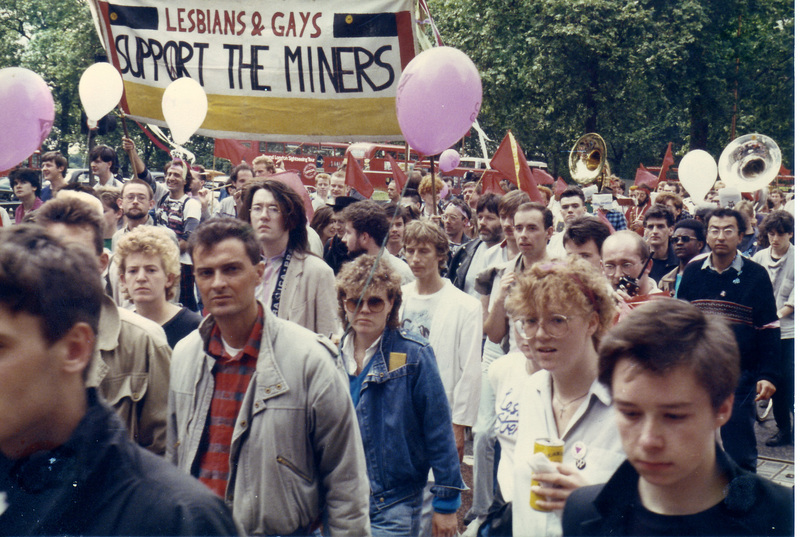 LGSM was born out of a meeting held at the University of London Student Union following an impromptu collection for striking miners at the 1984 Gay Pride March. Membership was not limited by class or political ideology, though some females uncomfortable with the male dominated culture did form a breakaway group, Lesbians Against Pit Closures (LAPC), in November 1984. Civil and High Court action fined the NUM so support groups were encouraged to link with communities directly. 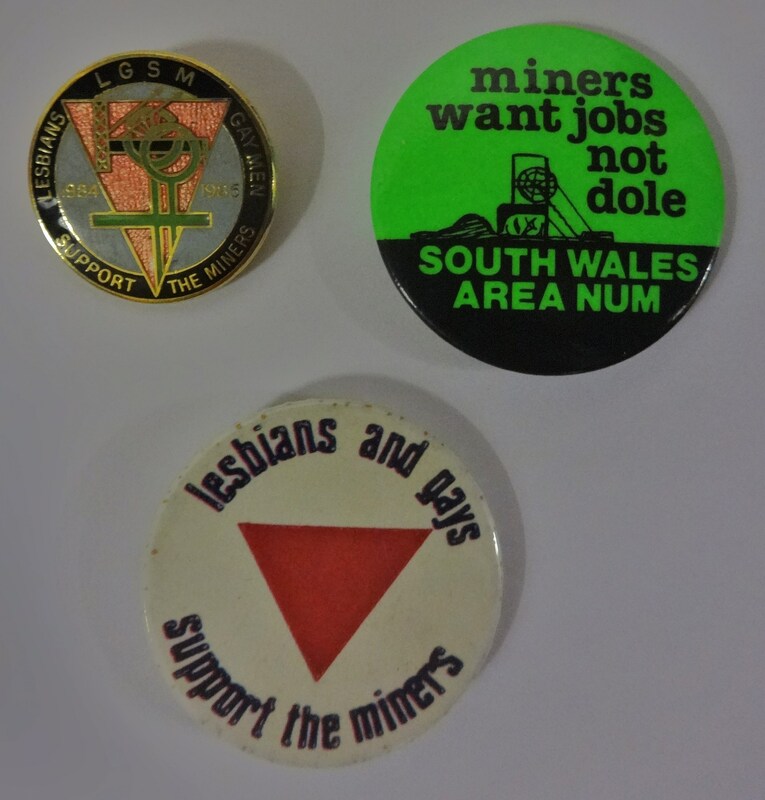 The London branch of LGSM linked with the Neath, Dulais and Swansea Valleys area in South Wales. Their work raised a total of £20, 000, from collections outside the Gay’s the Word Bookshop in Bloomsbury to jumble sales and bike rides. 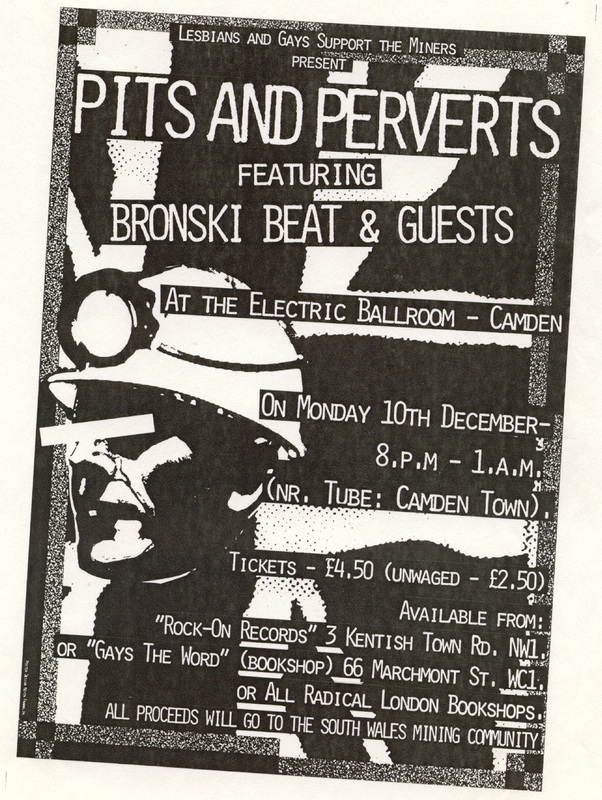 Their largest fundraiser was the ‘Pits & Perverts’ benefits gig at the Electric Ballroom in Camden. This event alone raised £5,000. 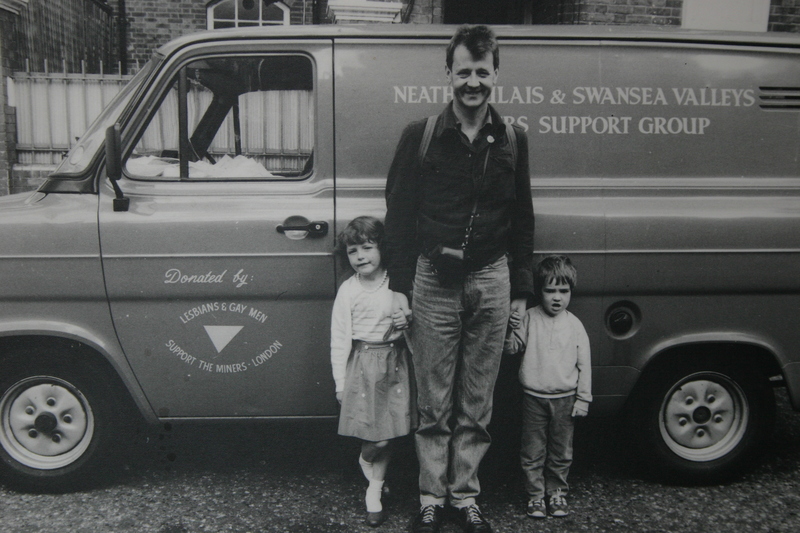 They also bought the mining community of Dulais a van, decked out with the LGSM logo. Despite such efforts, though, financial hardship took its toll and on 3rd March 1985 the NUM National Executive voted for a return to work. The LGSM was disbanded, but links between the communities remained. When LGSM was formed some felt offering support to workers who were traditionally seen as homophobic was naïve. In 1985 the Pride ‘85 march was led by an NUM banner and men, women and children from the Dulais mining community, in South Wales. And three years later, the Women’s Support Group of South Wales wrote to the former head of LGSM to pledge support to the campaign against Clause 28, believing the clause would lead to greater inequality and persecution of gay men and women. Information and images from the Working Class Movement Library , the Peoples History Museum and the LGSM archive held in the Labour History Archive at the Peoples History Museum. This entry was posted in Miners Strikes and tagged 1984 Miners Strikes, Arthur Scargill, Bloomsbury, Camden, Campaign, coal not dole, Fundraising, industrial action, LGSM, Margaret Thatcher, Miners Strikes, Pit Closures, posters, Pride 85', Protest, strike, Thatcher, Wales, WAPC, women against pit closures. Bookmark the permalink.